In our final installment of our three-year anniversary special, I look back at some of the experiences and strategies (intended or accidental) that have made this show what it is. Are you looking to start your own podcast? Want to be a bigger part of the audio drama community? Then I hope these tips help out a little bit. When I started this show, I had no idea where all of the content would come from. The very first thing I did is send out a blast to the Radio Drama Listserv looking for content and WOW did they respond. I have never actively seek new content since (though, of course, I still do).Huge kudos to Craig Wichman and Jay Stern who let me air their work without having any idea what I would be doing with this show. As I said, Craig Wichman and Jay Stern were happy to be interviewed way back in the early days – also special thanks to Scott Hickey and Brian Price who got involved early on.Interviewing all these storytellers, producers, writers, and directors has taught me a lot. I’ve learned who people are and where they’re coming from. What starts people down the mad course of becoming a radio dramatist – the challenges they’ve faced, the fun they’ve had, and the things they’ve learned and would do differently next time. Not only has this been great content to share with all of you, but it’s taught me a lot in my own life as a dramatist. I picked up field recording early on, avoided some missteps, learned the rigors of live recording, and have gotten the jist of how you make a production happen and what good audio sounds like. So, for everyone who’s ever been so generous to spend some time to talk to me, THANK YOU. Bob Arnold has started calling October “Audio Drama Month” and I’m in agreeance.As a lark, for the first year of RDR I produced a month-long series of spooky stories and saw traffic to this podcast blow up. The audience continued to grow at a steady basis until 2008, when I for the second time did a whole month of horror programming – kaplam! Another big spike in traffic. And this year, when I was running myself ragged with lack of sleep putting together my own live radio drama for Halloween, traffic spiked again, higher than ever, for Halloween 2009. October is huge in audio drama. Milk it. What makes the audio drama community so great is that it is full of pretention and egos.Unlike, well, some other performing and produced arts, audio dramatists are laid back, geeky people who you can have a beer with and talk shop. You’ll especially notice this if you have the opportunity to go to the National Audio Theater Festivals. So, I make an effort to give back all the gifts of time people have given me by linking out to their shows, promoting stuff they’ve got going on, and connecting them with other people who might be able to help them out, or dig their work. It’s what numerous other people have done for me, and the least I can do is pay it forward. And so far, it seems to be working. 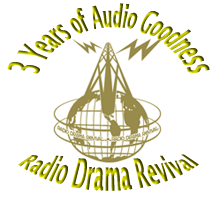 Radio Drama Revival continues to grow. I am a search marketer by trade, so I have a bit of an unfair advantage, but plenty of people can do what I’ve done without knowing all the other junk I know. Get set up on WordPress, install a few SEO plugins, and name your posts things that actually mention “radio drama” or maybe the genre of the show you’re featuring. It’s not rocket science. And hell, if producers want me to give an introductory course on SEO for audio producers, let me know! Also, things like making sure your mp3 files have ID3 tags, are named consistently, have artwork that comes up right in iTunes, etc… are all really subtle, but make your podcast look more professional and polished. RDR is produced for essentially $0 but that doesn’t mean I have an excuse not to look pro. I probably won’t do this again until we hit the big five-er 🙂 But, things continue to grow in audio drama, and believe me, you’ll see some pretty exciting news on this blog soon. So, as always and ever, keep your mind and your ears open and let’s be in touch.